NARRATIVE OF THE CAPTIVITY AND RESTORATION OF MRS. MARY ROWLANDSON. Part Seven. But instead of going either to Albany or homeward, we must go five miles up the river, and then go over it. Here we abode a while. Here lived a sorry Indian, who spoke to me to make him a shirt. When I had done it, he would pay me nothing. But he living by the riverside, where I often went to fetch water, I would often be putting of him in mind, and calling for my pay: At last he told me if I would make another shirt, for a papoose not yet born, he would give me a knife, which he did when I had done it. I carried the knife in, and my master asked me to give it him, and I was not a little glad that I had anything that they would accept of, and be pleased with. 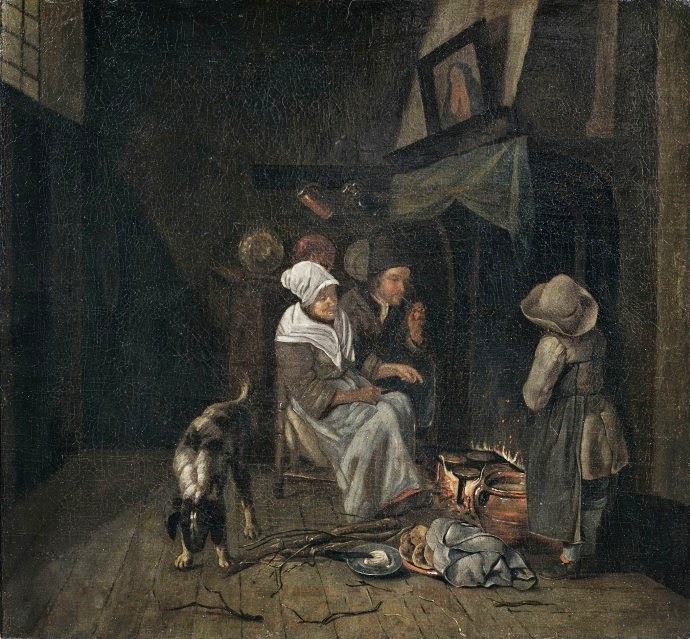 When we were at this place, my master's maid came home; she had been gone three weeks into the Narragansett country to fetch corn, where they had stored up some in the ground. She brought home about a peck and half of corn. 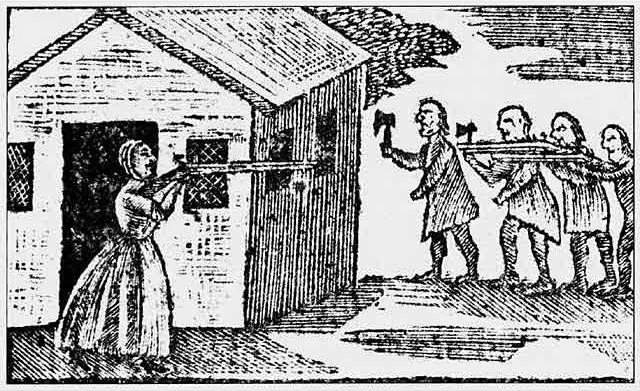 This was about the time that their great captain, Naananto, was killed in the Narragansett country. 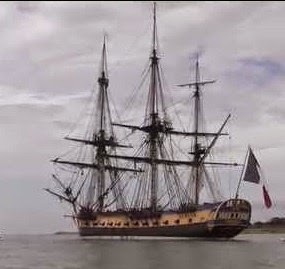 My son being now about a mile from me, I asked liberty to go and see him; they bade me go, and away I went; but quickly lost myself, traveling over hills and through swamps, and could not find the way to him. And I cannot but admire at the wonderful power and goodness of God to me, in that, though I was gone from home, and met with all sorts of Indians, and those I had no knowledge of, and there being no Christian soul near me; yet not one of them offered the least imaginable miscarriage to me. I turned homeward again, and met with my master. He showed me the way to my son. When I came to him I found him not well: and withall he had a boil on his side, which much troubled him. We bemoaned one another a while, as the Lord helped us, and then I returned again. When I was returned, I found myself as unsatisfied as I was before. I went up and down mourning and lamenting; and my spirit was ready to sink with the thoughts of my poor children. My son was ill, and I could not but think of his mournful looks, and no Christian friend was near him, to do any office of love for him, either for soul or body. And my poor girl, I knew not where she was, nor whether she was sick, or well, or alive, or dead. I repaired under these thoughts to my Bible (my great comfort in that time) and that Scripture came to my hand, "Cast thy burden upon the Lord, and He shall sustain thee" (Psalm 55.22). But I was fain to go and look after something to satisfy my hunger, and going among the wigwams, I went into one and there found a squaw who showed herself very kind to me, and gave me a piece of bear. I put it into my pocket, and came home, but could not find an opportunity to broil it, for fear they would get it from me, and there it lay all that day and night in my stinking pocket. In the morning I went to the same squaw, who had a kettle of ground nuts boiling. I asked her to let me boil my piece of bear in her kettle, which she did, and gave me some ground nuts to eat with it: and I cannot but think how pleasant it was to me. I have sometime seen bear baked very handsomely among the English, and some like it, but the thought that it was bear made me tremble. But now that was savory to me that one would think was enough to turn the stomach of a brute creature. One bitter cold day I could find no room to sit down before the fire. 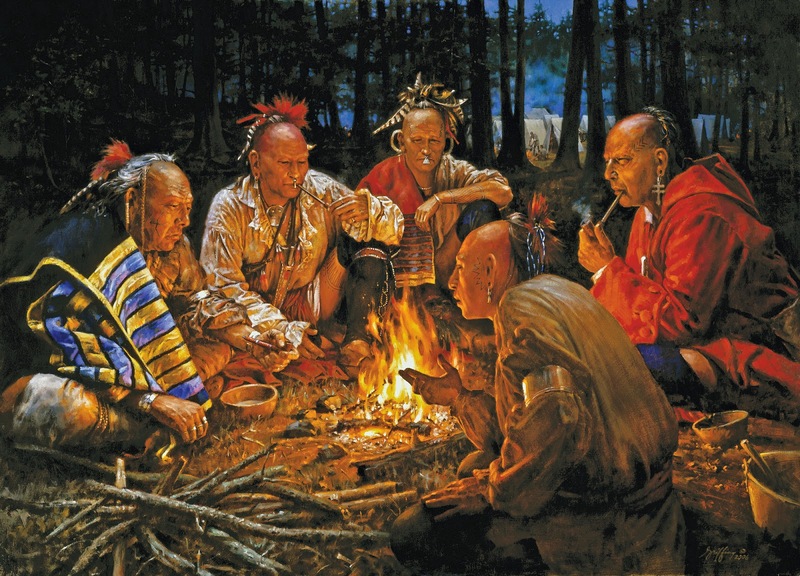 I went out, and could not tell what to do, but I went in to another wigwam, where they were also sitting round the fire, but the squaw laid a skin for me, and bid me sit down, and gave me some ground nuts, and bade me come again; and told me they would buy me, if they were able, and yet these were strangers to me that I never saw before. That day a small part of the company removed about three-quarters of a mile, intending further the next day. When they came to the place where they intended to lodge, and had pitched their wigwams, being hungry, I went again back to the place we were before at, to get something to eat, being encouraged by the squaw's kindness, who bade me come again. When I was there, there came an Indian to look after me, who when he had found me, kicked me all along. I went home and found venison roasting that night, but they would not give me one bit of it. Sometimes I met with favor, and sometimes with nothing but frowns. NARRATIVE OF THE CAPTIVITY AND RESTORATION OF MRS. MARY ROWLANDSON. Part Six. 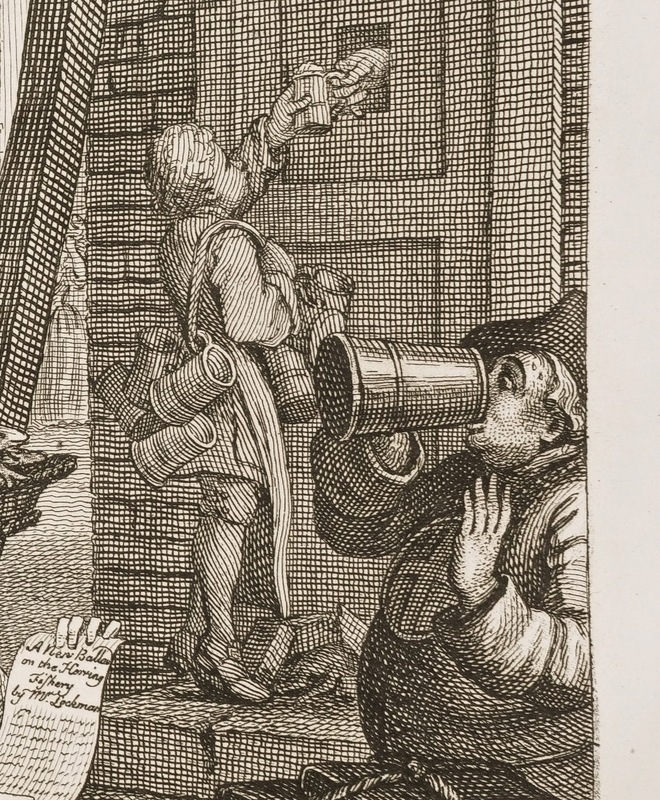 Courtesy of the Gutenberg Project. After a restless and hungry night there, we had a wearisome time of it the next day. The swamp by which we lay was, as it were, a deep dungeon, and an exceeding high and steep hill before it. Before I got to the top of the hill, I thought my heart and legs, and all would have broken, and failed me. What, through faintness and soreness of body, it was a grievous day of travel to me. As we went along, I saw a place where English cattle had been. That was comfort to me, such as it was. Quickly after that we came to an English path, which so took with me, that I thought I could have freely lyen down and died. That day, a little after noon, we came to Squakeag, where the Indians quickly spread themselves over the deserted English fields, gleaning what they could find. 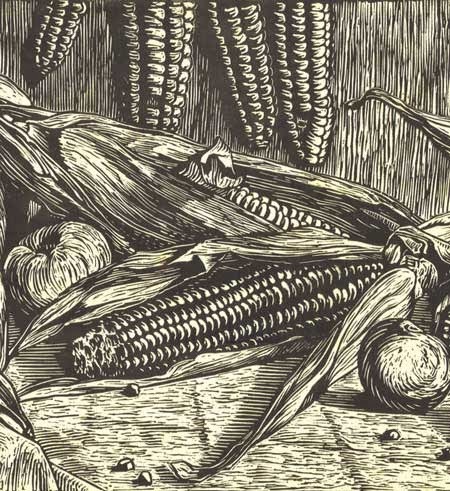 Some picked up ears of wheat that were crickled down; some found ears of Indian corn; some found ground nuts, and others sheaves of wheat that were frozen together in the shock, and went to threshing of them out. Myself got two ears of Indian corn, and whilst I did but turn my back, one of them was stolen from me, which much troubled me. There came an Indian to them at that time with a basket of horse liver. I asked him to give me a piece. "What," says he, "can you eat horse liver?" I told him, I would try, if he would give a piece, which he did, and I laid it on the coals to roast. But before it was half ready they got half of it away from me, so that I was fain to take the rest and eat it as it was, with the blood about my mouth, and yet a savory bit it was to me: "For to the hungry soul every bitter thing is sweet." A solemn sight methought it was, to see fields of wheat and Indian corn forsaken and spoiled and the remainders of them to be food for our merciless enemies. That night we had a mess of wheat for our supper. 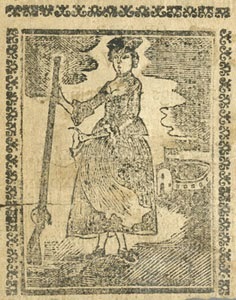 NARRATIVE OF THE CAPTIVITY AND RESTORATION OF MRS. MARY ROWLANDSON. Part Five. And now I must part with that little company I had. Here I parted from my daughter Mary (whom I never saw again till I saw her in Dorchester, returned from captivity), and from four little cousins and neighbors, some of which I never saw afterward: the Lord only knows the end of them. Amongst them also was that poor woman before mentioned, who came to a sad end, as some of the company told me in my travel: she having much grief upon her spirit about her miserable condition, being so near her time, she would be often asking the Indians to let her go home; they not being willing to that, and yet vexed with her importunity, gathered a great company together about her and stripped her naked, and set her in the midst of them, and when they had sung and danced about her (in their hellish manner) as long as they pleased they knocked her on head, and the child in her arms with her. When they had done that they made a fire and put them both into it, and told the other children that were with them that if they attempted to go home, they would serve them in like manner. The children said she did not shed one tear, but prayed all the while. But to return to my own journey, we traveled about half a day or little more, and came to a desolate place in the wilderness, where there were no wigwams or inhabitants before; we came about the middle of the afternoon to this place, cold and wet, and snowy, and hungry, and weary, and no refreshing for man but the cold ground to sit on, and our poor Indian cheer. Heart-aching thoughts here I had about my poor children, who were scattered up and down among the wild beasts of the forest. My head was light and dizzy (either through hunger or hard lodging, or trouble or all together), my knees feeble, my body raw by sitting double night and day, that I cannot express to man the affliction that lay upon my spirit, but the Lord helped me at that time to express it to Himself. I opened my Bible to read, and the Lord brought that precious Scripture to me. "Thus saith the Lord, refrain thy voice from weeping, and thine eyes from tears, for thy work shall be rewarded, and they shall come again from the land of the enemy" (Jeremiah 31.16). This was a sweet cordial to me when I was ready to faint; many and many a time have I sat down and wept sweetly over this Scripture. At this place we continued about four days. 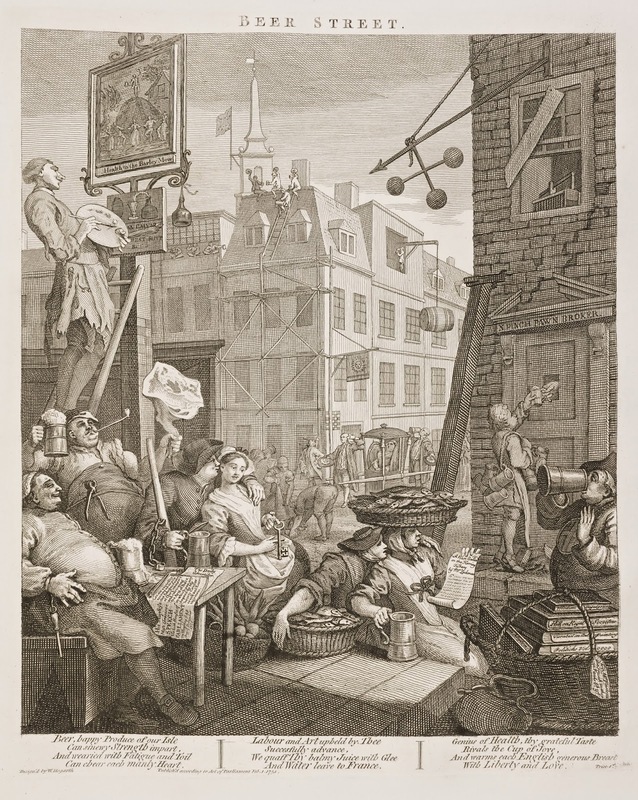 NARRATIVE OF THE CAPTIVITY AND RESTORATION OF MRS. MARY ROWLANDSON. Part Four. But now, the next morning, I must turn my back upon the town, and travel with them into the vast and desolate wilderness, I knew not whither. It is not my tongue, or pen, can express the sorrows of my heart, and bitterness of my spirit that I had at this departure: but God was with me in a wonderful manner, carrying me along, and bearing up my spirit, that it did not quite fail. 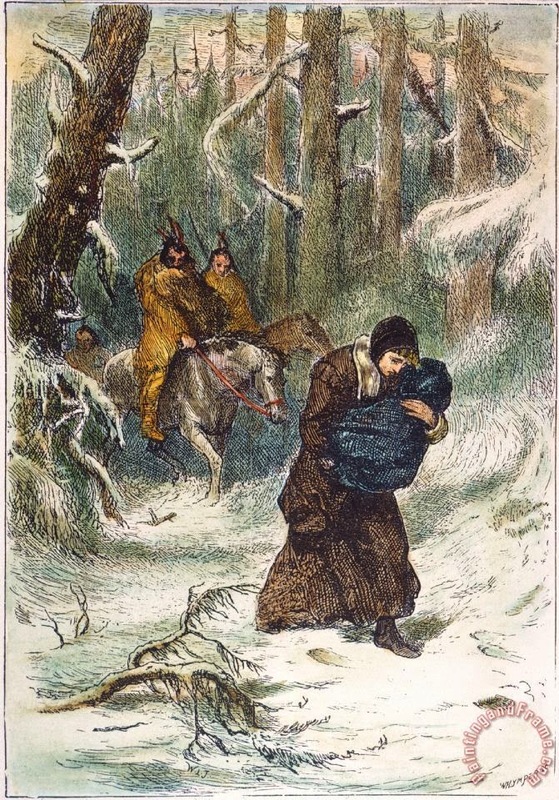 One of the Indians carried my poor wounded babe upon a horse; it went moaning all along, "I shall die, I shall die." I went on foot after it, with sorrow that cannot be expressed. At length I took it off the horse, and carried it in my arms till my strength failed, and I fell down with it. Then they set me upon a horse with my wounded child in my lap, and there being no furniture upon the horse's back, as we were going down a steep hill we both fell over the horse's head, at which they, like inhumane creatures, laughed, and rejoiced to see it, though I thought we should there have ended our days, as overcome with so many difficulties. But the Lord renewed my strength still, and carried me along, that I might see more of His power; yea, so much that I could never have thought of, had I not experienced it. The morning being come, they prepared to go on their way. One of the Indians got up upon a horse, and they set me up behind him, with my poor sick babe in my lap. 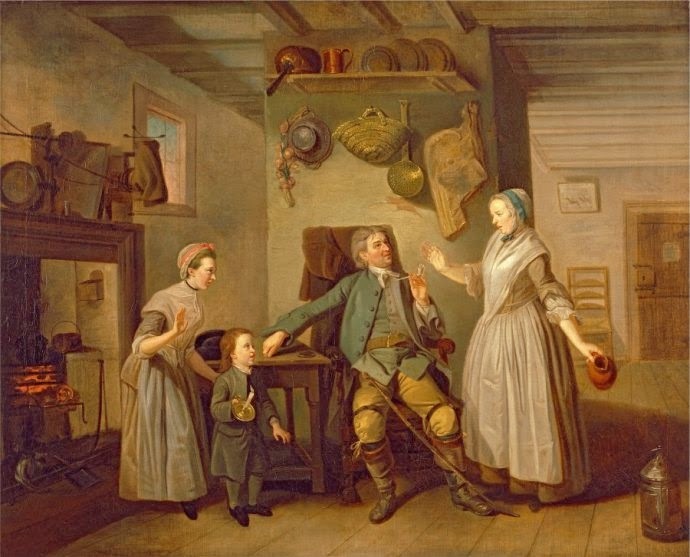 A very wearisome and tedious day I had of it; what with my own wound, and my child's being so exceeding sick, and in a lamentable condition with her wound. It may be easily judged what a poor feeble condition we were in, there being not the least crumb of refreshing that came within either of our mouths from Wednesday night to Saturday night, except only a little cold water. This day in the afternoon, about an hour by sun, we came to the place where they intended, viz. an Indian town, called Wenimesset, northward of Quabaug. When we were come, Oh the number of pagans (now merciless enemies) that there came about me, that I may say as David, "I had fainted, unless I had believed, etc" (Psalm 27.13). The next day was the Sabbath. I then remembered how careless I had been of God's holy time; how many Sabbaths I had lost and misspent, and how evilly I had walked in God's sight; which lay so close unto my spirit, that it was easy for me to see how righteous it was with God to cut off the thread of my life and cast me out of His presence forever. Yet the Lord still showed mercy to me, and upheld me; and as He wounded me with one hand, so he healed me with the other. This day there came to me one Robert Pepper (a man belonging to Roxbury) who was taken in Captain Beers's fight, and had been now a considerable time with the Indians; and up with them almost as far as Albany, to see King Philip, as he told me, and was now very lately come into these parts. Hearing, I say, that I was in this Indian town, he obtained leave to come and see me. 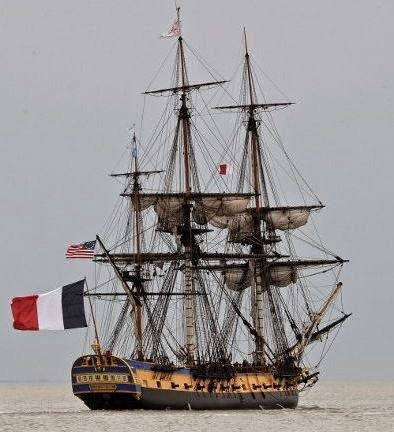 He told me he himself was wounded in the leg at Captain Beer's fight; and was not able some time to go, but as they carried him, and as he took oaken leaves and laid to his wound, and through the blessing of God he was able to travel again. Then I took oaken leaves and laid to my side, and with the blessing of God it cured me also; yet before the cure was wrought, I may say, as it is in Psalm 38.5-6 "My wounds stink and are corrupt, I am troubled, I am bowed down greatly, I go mourning all the day long." I sat much alone with a poor wounded child in my lap, which moaned night and day, having nothing to revive the body, or cheer the spirits of her, but instead of that, sometimes one Indian would come and tell me one hour that "your master will knock your child in the head," and then a second, and then a third, "your master will quickly knock your child in the head." 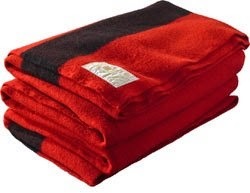 This was the comfort I had from them, miserable comforters are ye all, as he said. Thus nine days I sat upon my knees, with my babe in my lap, till my flesh was raw again; my child being even ready to depart this sorrowful world, they bade me carry it out to another wigwam (I suppose because they would not be troubled with such spectacles) whither I went with a very heavy heart, and down I sat with the picture of death in my lap. About two hours in the night, my sweet babe like a lamb departed this life on Feb. 18, 1675. It being about six years, and five months old. 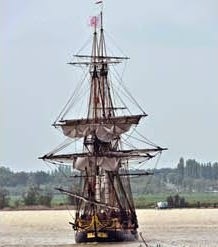 It was nine days from the first wounding, in this miserable condition, without any refreshing of one nature or other, except a little cold water. I cannot but take notice how at another time I could not bear to be in the room where any dead person was, but now the case is changed; I must and could lie down by my dead babe, side by side all the night after. I have thought since of the wonderful goodness of God to me in preserving me in the use of my reason and senses in that distressed time, that I did not use wicked and violent means to end my own miserable life. 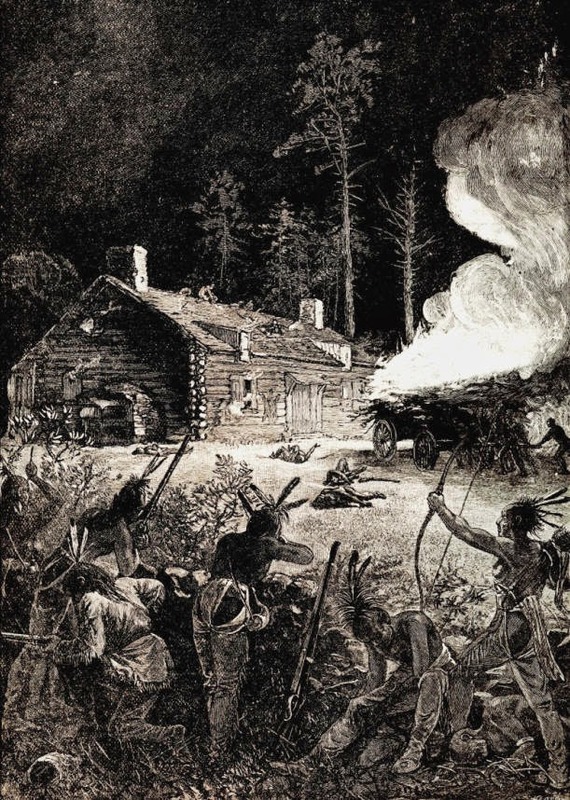 In the morning, when they understood that my child was dead they sent for me home to my master's wigwam (by my master in this writing, must be understood Quinnapin, who was a Sagamore, and married King Philip's wife's sister; not that he first took me, but I was sold to him by another Narragansett Indian, who took me when first I came out of the garrison). I went to take up my dead child in my arms to carry it with me, but they bid me let it alone; there was no resisting, but go I must and leave it. When I had been at my master's wigwam, I took the first opportunity I could get to go look after my dead child. When I came I asked them what they had done with it; then they told me it was upon the hill. Then they went and showed me where it was, where I saw the ground was newly digged, and there they told me they had buried it. Finding the right type of water bottle for your persona & period seems to be an ongoing quest, or at least it is for me. 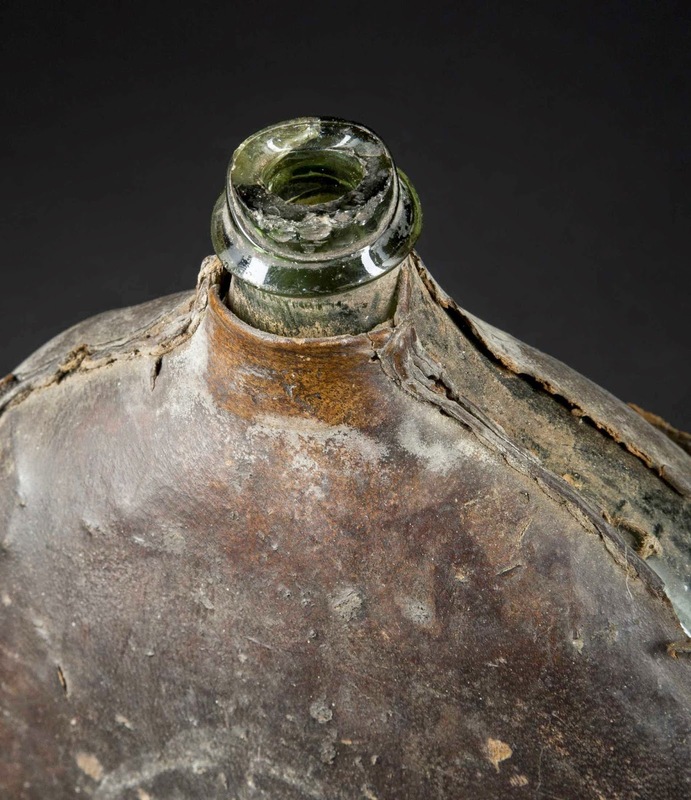 I have tinned iron military water bottles but they don’t hold much water & I prefer something from an earlier period. Being quite old now, I feel more comfortable with an earlier period water container. I have a costrel, but the sealant inside failed & exposed the leather & fouled the water. I have re-sealed this bottle, but in doing so I overheated the costrel & shrunk it. It did seal, but now I don’t trust it. Recently someone in one of the Ranger groups asked for advice on what type of water bottle he should get. In my search for more information I used the term “flask”. This surprisingly brought up the name “saddle flask”. Further searching brought up “pocket or saddle flask”. Now this is a new one on me, so I researched further. Most of the saddle flasks I found were Persian, but I did manage to find some English flasks, & some American flasks. 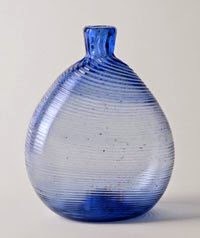 Early American glass. 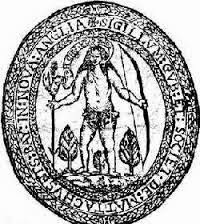 The first factory in what is now the United States was a glass plant built at Jamestown, Virginia, in 1608. The venture failed within a year because of a famine that took the lives of many colonists. 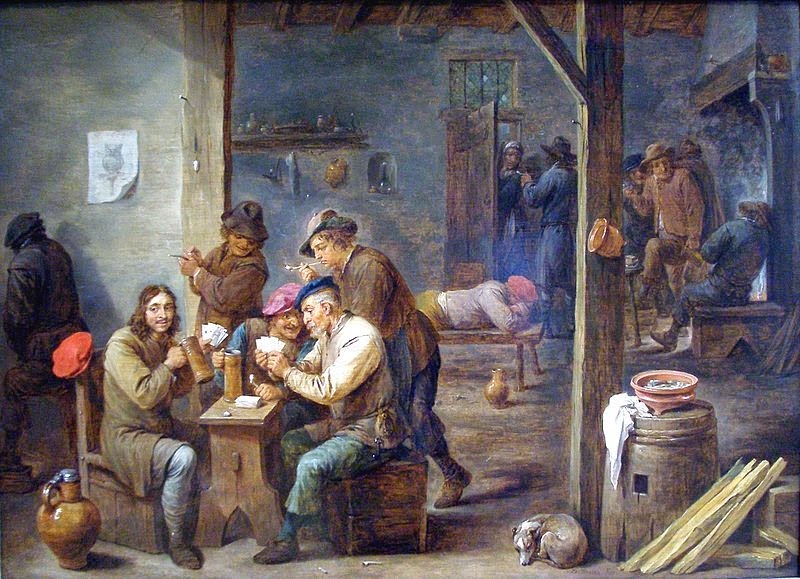 The Jamestown colonists tried glassmaking again in 1621, but an Indian attack in 1622 and the scarcity of workers ended this attempt in 1624. 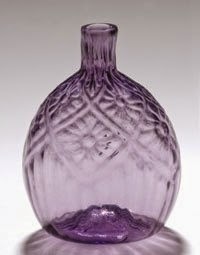 The industry was reestablished in America in 1739, when Caspar Wistar built a glassmaking plant in what is now Salem County, New Jersey. This plant operated until 1780. 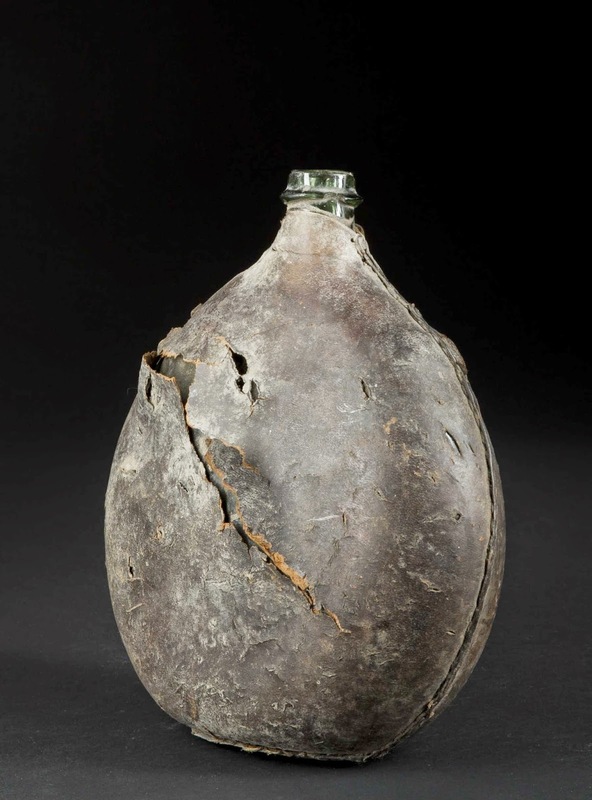 This is purportedly an American saddle flask. 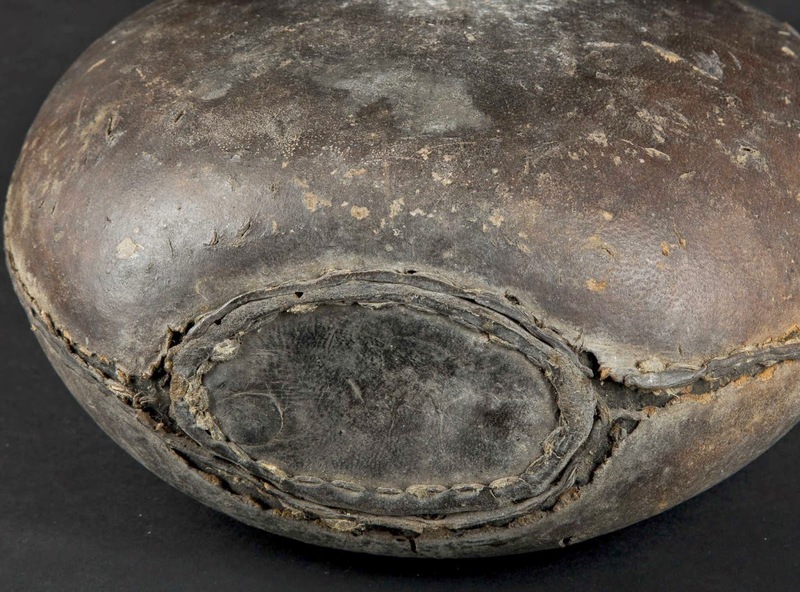 From the name I think we can safely assume that this large leather covered water bottle was carried on a riding saddle or in a market wallet tied to the saddle or similar. 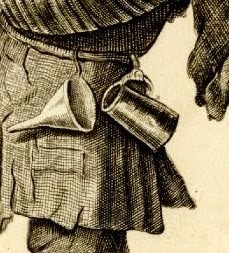 Then there is the accompanying name of “pocket flask”. I think this is a mistake, because further research indicates that these are two different flasks, & I think these pocket flasks were meant to be carried in a coat pocket. 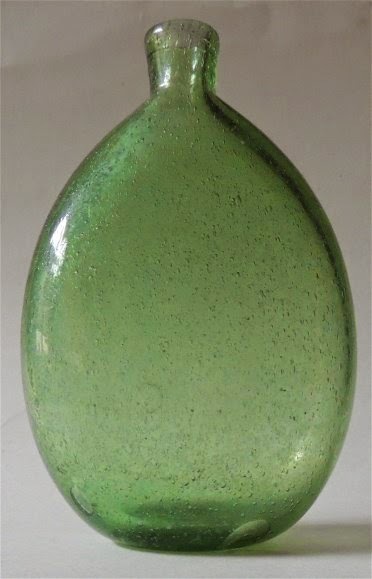 This green glass saddle flask is also reportedly an American flask. 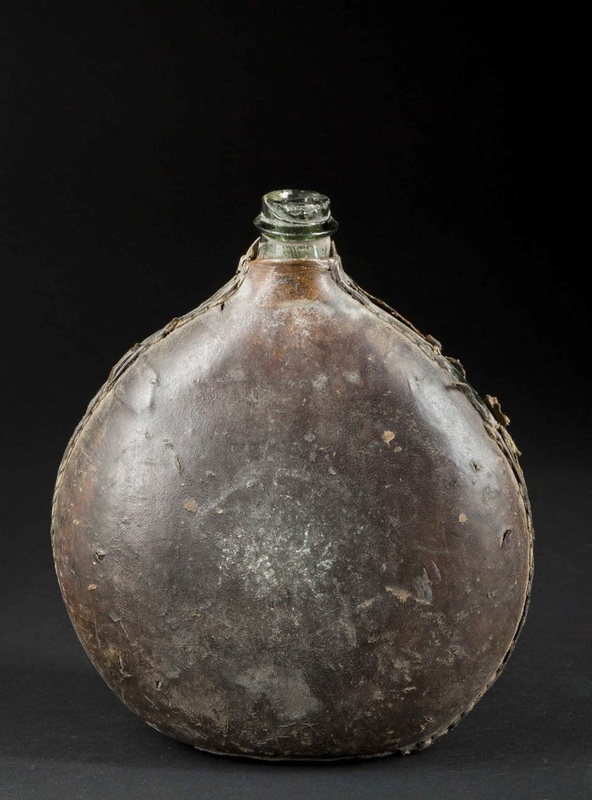 Large circa 1760 colonial American black glass flask. 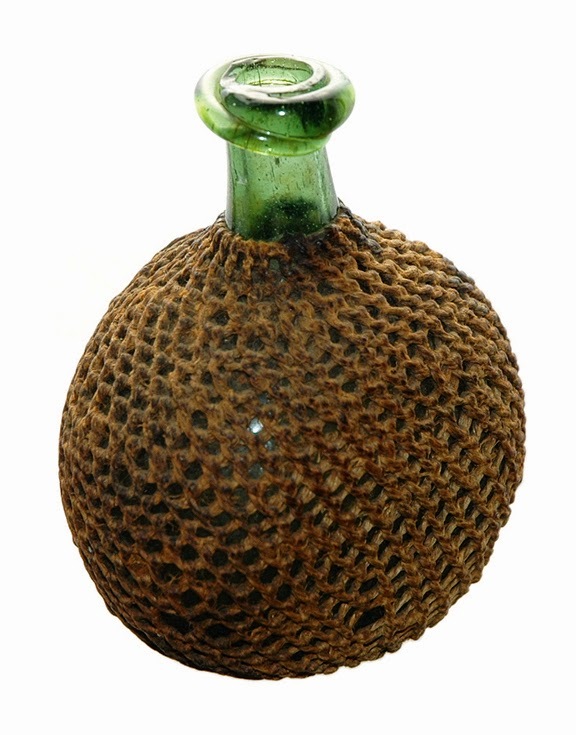 Wistarburgh Saddle Flask 18th Century. Rich, dark green American chestnut with hemp wicker. 4” tall and 2 3/8” at the widest point. Recovered during 1961 demolition of historic building in downtown Philadelphia. Found inside a wall. 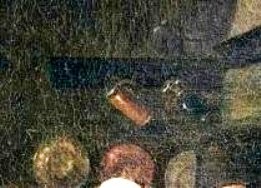 This one I assume is a pocket flask. 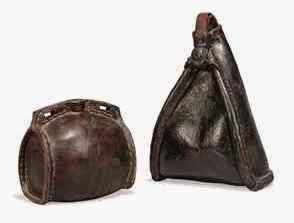 This image shows an English leather costrel on the left, & a leather saddle flask on the right. NARRATIVE OF THE CAPTIVITY AND RESTORATION OF MRS. MARY ROWLANDSON. Part Three. 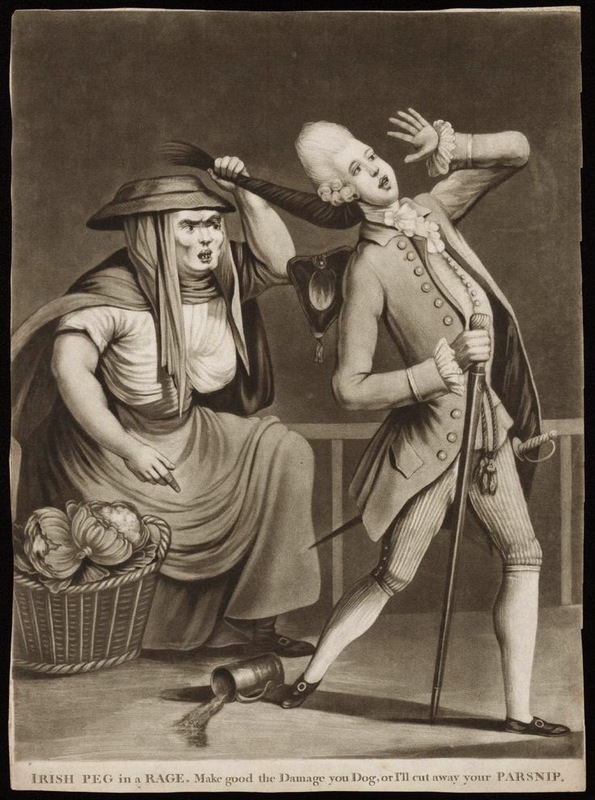 NARRATIVE OF THE CAPTIVITY AND RESTORATION OF MRS. MARY ROWLANDSON. Part Two. 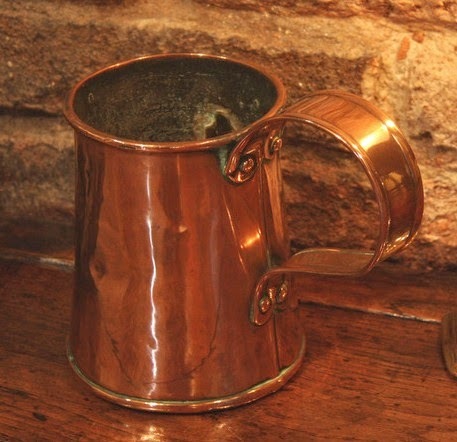 17th & 18th Century Copper Mugs & Tankards. My thanks to Ward Oles for asking for this information. 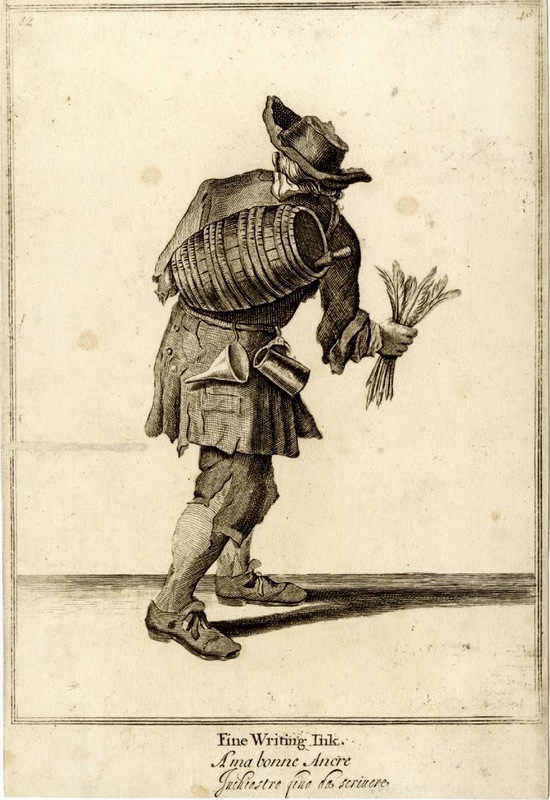 The Ink Seller Mid 18th Century. French. 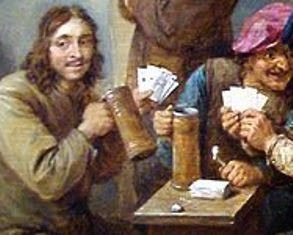 Jan Josef Horemans the Elder 1694-1759 Flemish. 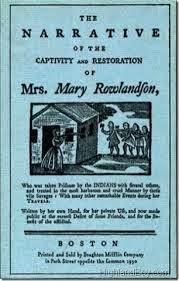 NARRATIVE OF THE CAPTIVITY AND RESTORATION OF MRS. MARY ROWLANDSON. Part One. 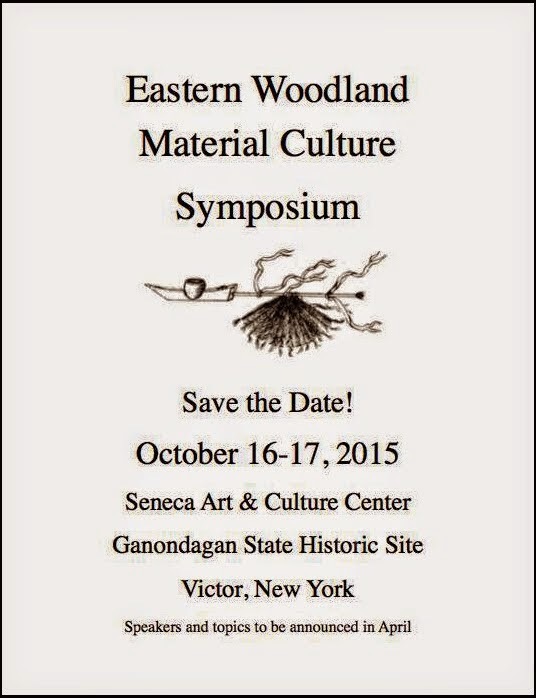 Eastern Woodland Material Culture Symposium. Dried, Parched & Popped Corn By Keith H Burgess. VIDEO. Dried Corn, Parched Corn, & Popped Corn. There are several ways you can cook & preserve corn. Corn can be boiled, & it can be added to other vegetables & meat. Corn can be parched & ground into a meal or flour & carried on the trail as a trail food. This ground parched meal can have water added to it to make it more palatable. Corn can also be popped & eaten & this popped corn can also be carried as a trail food. Left to right: Parched corn, dried corn, & popped corn. Corn can be dried on the cob by hanging it from it’s outer leafy layer & it can then be stored. Or this dried corn can be parched & stored or ground into a meal & stored. 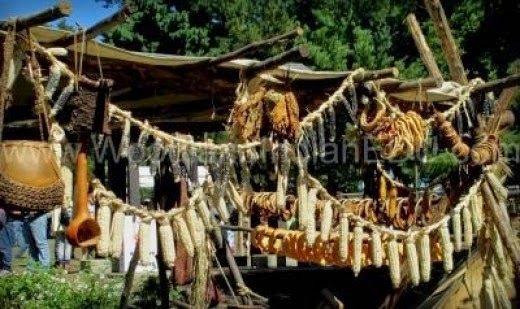 Dried corn can be made by cutting the corn from the cob & spreading it on bark in the sun, or it can be dried on the cob by hanging in the sun. Dried corn is just that, corn which has been dried. But parched corn is a super dried corn. To parch corn you can either: remove it from the cob & spread it on flat rocks in or around the fire, or you can place it in the hot ashes until done & then sift the ashes. When pottery came into use, a clay pot would be placed in the fire at an angle & hot ashes would be piled up & placed over the pot. Shucked corn would then be placed into the pot to parch. When parched, the corn kernels would be hard & crisp. Another way to use the clay pot was to part fill the pot with hot ashes, & then add the shucked corn. 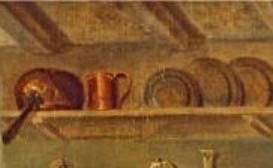 Later when iron pots & skillets were available, the shucked corn would be placed in these & shaken periodically to make sure the corn kernels did not burn. I have found no mention of oil or grease being used in the parching process. Popped corn was made with a different corn to the normal white, yellow or sweet corns. Popped corn is a type of flint corn, & to make it you can place it on a hot flat rock in the fire, or you can place it in hot ashes. 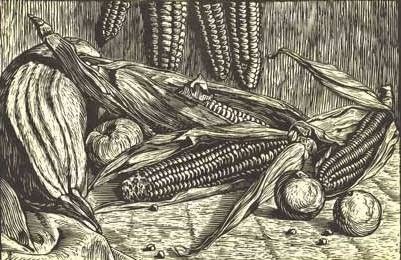 When it pops, the kernels will jump from the fire or the ashes & must be retrieved. If placed in an iron pot with a lid, it may be wise to rub a little grease round the inside of the pot, but not too much. Drying corn on the cob by tying the gathered husk & hanging. Botah Kap.ussa (Cold Flour) : Shell corn from the cob when the grain has reached the stage where it is firm but not dry. Place the shelled corn in a large pot of hot ashes, keeping the pot over coals of fire until the corn is parched a golden brown, in the meantime stirring the grain to keep it from scorching. Put the corn into the fanner, and clean off the ashes. Next pound the corn in the mortar until the husks are loosened. Again clean out the husks from the grain in the fanner. Beat the clean corn into flour in the mortar. This parched corn flour may be sweetened with enough sugar to taste. Add enough water to dampen a small serving, and eat as a cereal. A small amount of botah kapussah will go a long way as food. In tribal times, the Indian hunter took a small bag of this unsweetened food with him on long expeditions, often traveling many days with nothing else to eat except botaic kapussuh, a little at a time generally mixed with water. This cold flour was a boon on a long hunting expedition because a small amount was nourishing, and a bag of it was light and easy to carry. Earthquake In The 18th Century. The Duel at Blood Creek - Short Film from Leo Burton on Vimeo. Drying Corn On The Cob For Storing Or Trail Food. VIDEO. Archive for the ‘corn’ Category. FORTBLOG. Fire Steels. Researching Three Types. Cross Buns From Pegs & Tails.